Cy5-ProTx-II is a fluorescently labeled ProTx-II, a famous Nav1.7 blocker. The wild type ProTx-II blocks Nav1.7 with an IC50 value of around 300 pM, Nav1.2, Nav1.5 and Nav1.6 with IC50 values of 41 nM, 79 nM and 26 nM respectively. The Cy5-ProTx-II version developed by Smartox has potent Nav1.7 blocking activity. It was shown to fully block Nav1.7 at 100 nM concentration. A, Recording traces of transiently-expressed human Nav1.7 current in the presence of Cy5-ProTx-II (100 nM). The current was elicited by a 50 ms-depolarizing pulse to -10 mV from a holding potential of -90 mV. Inter-sweep period was 10 s. Current amplitudes were plotted against time. Note that toxin-induced inhibition is resistant to washout, however it can be partially relieved by depolarizing the cell membrane at the time point indicated by the red bar. B, C, Recording traces of hNav1.7 current in the presence of Cy5-ProTx-II (100 nM) from two distinct cells. 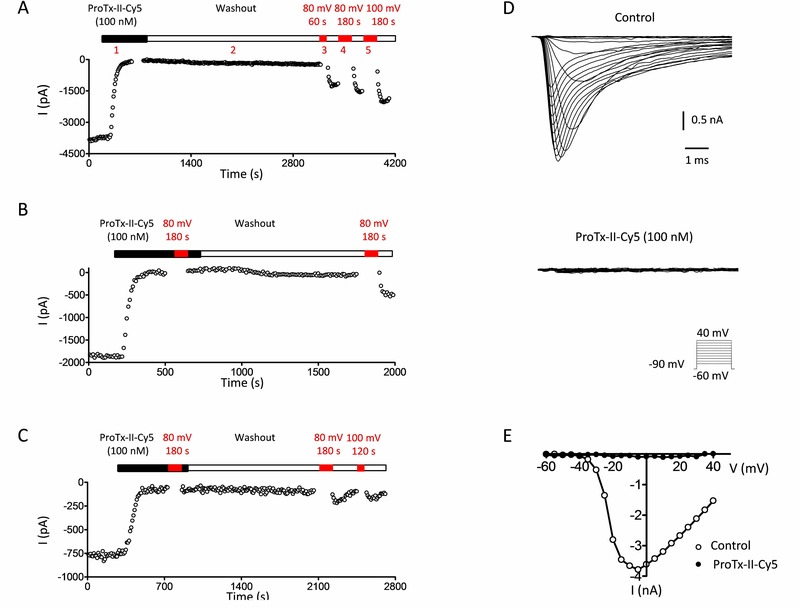 Membrane depolarization fails to relieve the inhibition in the presence of 100 nM Cy5-ProTx-II; however the inhibition can be partially relieved by depolarization after washout. D, Families of hNav1.7 current traces in control and in the presence of 100 nM Cy5-ProTx-II. Currents were evoked by depolarizing pulses from -60 mV to 40 mV, while the cell was hold at -90 mV. E, Amplitude-voltage relationships obtained from D.
Product code: N/A. Category: Sodium channels. Tags: Nav1.7, protoxin, protx.